NGA Tour pro golfer Thomas Campbell and his Clicgear push cart. He says it makes life on the developmental and mini-tour circuit a lot easier. Beginning this year, I started to use a Clicgear Cart (which sponsors Campbell) on the National Golf Association tour. Until I gain status on the Web.com Tour (which is a step below the PGA), all of the developmental and mini-tours in the country allow the use of push carts — unless we are required to ride in golf carts. I have seen a huge increase in the use of push carts by mini-tour players over the past couple of years. When I turned pro three years ago, almost all players carried their own bags, unless a friend, girlfriend, wife or parent was able to help out. Now, every group I play in has at least one push cart, usually two. Not bad odds, and the predominant push cart being used is a Clicgear Cart. And that’s for good reason: I rate it a 10 out of 10. I wanted to talk about how awesome the Clicgear Cart equipment is! The current model I use while competing is the 3.5+. I use the following accessories: storage bag/travel cover, cup holder, rain cover and umbrella holder. There also are many other accessories that Clicgear Cart has to offer. Pro golfer Thomas Campbell’s own Clicgear Push Cart. He says it’s become a necessity on the NGA Tour. 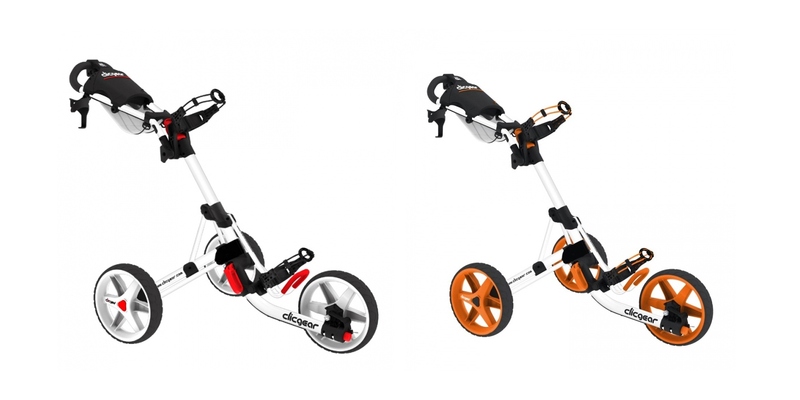 The push cart itself has a three-wheel design, which folds up or unfolds very easily in a matter of seconds. It will fit into any trunk and not take up too much space either. I mean, the cart itself only weighs 18 pounds, which enables me to travel everywhere with it. Considering I have been flying to most events this year, this makes life much easier. I simply put the cart in the storage/travel bag and put any of my other stuff inside. There’s plenty of room in the bag, and it is light. Luckily, I fly Southwest Airlines, and I get two free checked bags. So those are my personal travel and Clicgear Cart golf storage bags. By the way, this cart is built very well, everything feels solid and clicks into place nicely. The brakes lock and unlock easily, and the front wheel lock stops it from rolling. It does take a couple of attempts to learn the process of folding and unfolding the cart. But once you get it, it is very simple. And nothing feels flimsy about this cart. Once the cart is unfolded it is really easy to clip any size golf bag on the cart, and the wheels roll trouble-free on any terrain. The Clicgear Cart is extremely easy to push, too. And the wide base also keeps it stable. The Clicgear comes with a storage bag, and Thomas often checks for flights a Clicgear travel bag, too. It’s designed to make traveling and storing your Clicgear Cart simple. The full-length zipper allows the bag to open up nice and wide to easily remove or store the cart inside. The padded sides of the bag protect your cart when traveling, too. It is a great way to keep it looking great for years. As mentioned, I use this bag when flying to my events. Once the cart is in the bag, there still is plenty of room to store shoes, clothes and other necessities inside it as well. Even when I have my own car, I still use the bag to store my push cart after each round. Any grass that the wheels pick up end up in the bag, not all over the trunk of my car. The Clicgear Push Cart has an easy-to-use rain cover. The Clicgear Cart golf bag rain cover is an awesome accessory to keep your golf bag dry in the rain. The cover completely engulfs your golf bag providing rain-resistant protection to your bag and clubs while still making them accessible and dry. The rain cover is a light material with waterproof zippers on the top and side of the cover to enable easy access to all of you golf bag pockets and clubs. The cover clips to the cart itself with two adjustable nylon straps. This is designed to provide convenient access to your beverage while in competition. The cup holder attaches to the handle of the cart using an accessory tab. The cup holder is universal and expands to fit many different beverage sizes. This way you don’t have to go searching in your golf bag for your drink. The Clicgear Push Cart’s umbrella accessory. What I feel is the coolest accessory available with your Clicgear Cart is the umbrella holder. I know not all golfers keep playing in the rain, but when you are competing — if there is no thunder or lightning — we must keep playing. It is so simple all I need to do is put my umbrella in the mount, and as I walk my clubs and I stay dry. The umbrella also can be used by players that want shade from the sun while pushing your cart. I love the Clicgear Cart, and after using it for more than a month now my body feels so much better since I don’t have to carry my bag. It is just as good as having a caddy! Poll: PGA Player You’d Play 18/Drink Beer With?